You know, sometimes the best answer is also the simplest answer. William of Ockham (Occam) was a 14th century English philosopher who came up with the 'crazy' notion that perhaps the simplest answer is the best one and it became known, oddly enough, as 'Occam's Razor'. Same with the idea that perhaps the United States should go completely to a consumption tax to replace the current income tax system in its entirety. For much of US history, incomes were modest by any standards, especially when we were primarily an agrarian nation and people worked on their farms to put food on the table. But now that we have millions of people who own stocks in their portfolios and a far wider middle-to-higher income cohort in America in 2010 versus that of 1913, maybe it really is time to rethink what is the best way to tax people so that they can not monkey around with the tax code at all. The simplest way is to make everyone pay their 'fair share' of the taxes we need to fund the federal government at the end of the line of consumption, i.e. at the cashier's scanner. 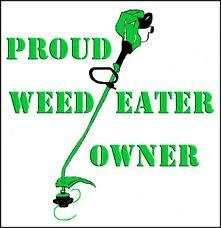 Poulan Weed-Eater: retail price, $200. Roughly $12.00 is borrowed to pay for defense, homeland security and the rest of discretionary spending from the Chinese. Thanks for shopping at Wal-Mart!" This would help the average American clearly see where their tax dollars are being spent on each and every transaction they make every single day. Just being able to make the connection between their tax dollar payments and where it actually goes would be an enormous help in getting people to see what we are dealing with nowadays in real-time. Today, people are just being fed distorted information from both sides merely and purely for tactical political gain and advantage. There can be some limited exclusions for people below the poverty line to receive federal assistance to either repay this consumption tax or forego it altogether since so much of their resources go towards the basic necessities of food and shelter. But that would be about it. No longer would anyone be able to manipulate the arcane and byzantine tax laws of this nation to their advantage. Everyone would clearly know and see what their tax liability is on each and every purchase and receipt printed out at the check-out counter or at the closing of a purchase of a home or automobile. So are you proposing that federal income tax be completely eliminated and replace by consumption tax? What about state income taxes? I am guessing the states would have to follow suit and do the same to keep it consistent. except for the states like Florida where there is no income tax right now...why do you think LeBron left Ohio to play for the Heat? He ain't dumb and he is rich....so he figured that out pretty quickly. Yes, Frank is correct. Since most states that have income taxes use the Federal income tax as the baseline, it is logical to assume that the states will either completely write their own entire income tax code, or simply adopt their own consumption tax...which would be an easier to administer and less expensive option. SC is already moving in this direction with a bill in the legislature to eliminate the state personal and corporate income tax and thus open the state up for business development. Is It The ‘Laffer Curve’ or the ‘Laugher Curve’?